Mobility Scooter Clothing Scooter Leg Wrap Waterproof. 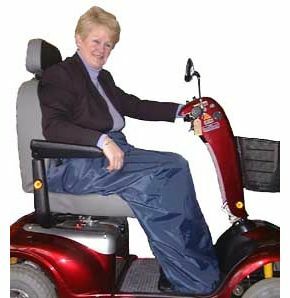 Mobility Scooter Clothing-The open back design of this scooter leg protector ensures that this leg wrap can be put on and taken off with ease. It has a reinforced bottom that your feet hold the cover in place with, it has extended wings that can be sat upon, to secure the top, or as an alternative, there is a waist band that can be used if required. The outer is fully waterproof and it is lined with a luxurious fleece, this wrap will keep you dry and warm with ease. Does exactly what it says on the \'tin\'. Keeps my legs nice and warm in this cold weather. Generous belt length with quick release clips. Good buy. Excellent product, just right. However, what we are finding now with mail orders is the delivery people are opening the mail. My husband ordered an item that needs assembling, the delivery people opened it and some of the bolts were missing. Your item was opened by "Hermes". My husband asked her what's in the the parcel? I don't know she replied as she ran down the drive. When he brought it in there was a big hole in the parcel. So from now on we will be going back to the shops to get our needs and other goods. Parcel force stole money out of the parcel we sent to our son. Mail order will decline. I was delighted with the speed of delivery of my order. Well done! I,m less sure about the 'one size fits all" idea because obviously it doesn`t! I find it rather unwieldy round the lower leg, but cosy and warm, which is what I wanted.